Home > Charities > Harrogate’s charity’s “shameless” link to string of prime time TV shows! A Harrogate charity has admitted to having a “shameless” link to a number of prime-time TV dramas screened over the last few years. And, in addition to items donated to Disability Action Yorkshire’s furniture enterprise helping dress the set of the Channel 4 hit, Shameless, numerous pieces have also featured on “In The Club”, and, more recently, The Syndicate – which was filmed at Bramham Park country house. The charity’s furniture warehouse, based at Hornbeam Park, has become a firm hunting ground of Harrogate prop buyer, Bert Mackay, who, since 1978, has worked on scores of other well-known productions, including Eastenders, Birds of a Feather, The New Statesman and Sunburn. 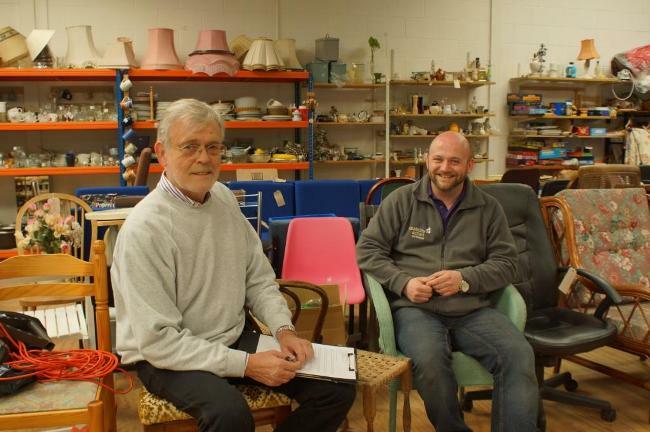 Bert said: “I first found at about Disability Action Yorkshire’s furniture warehouse after trawling the internet for specific items I needed for a set I was working on. “Since that day I have gone there wherever possible. It’s usually really good quality and, with budgets on a shoestring, a lot cheaper to buy than hiring from a prop hire company in London and transporting it to and from a film set in the north of England. Bert added: “When I go to Disability Action Yorkshire I don’t know what I will find, but more often than not I strike lucky. Just looking around the other day I saw a set of chairs that would have made a great doctor’s waiting room! Disability Action Yorkshire chief executive Jackie Snape said: “Thanks to Bert – and those who very kindly donate furniture to our enterprise – we are now associated with some of the best-known and best-watched TV dramas of recent years. “For us, our furniture enterprise is a key component of our work. It not only generates much needed income for the charity, but equally as important it helps provide work and training for young disabled people.